Clary Fray just wishes that her life would go back to normal. But what’s normal when you’re a demon-slaying Shadowhunter, your mother is in a magically induced coma, and you can suddenly see Downworlders like werewolves, vampires, and faeries? Clary would love to spend more time with her best friend, Simon. 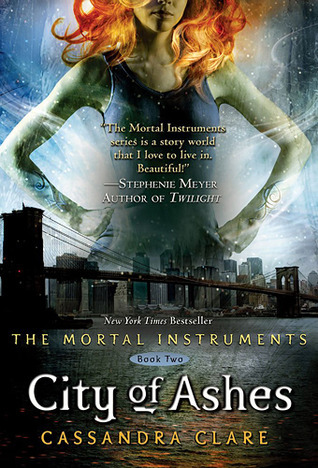 But the Shadowhunters won’t let her go–especially her handsome, infuriating newfound brother, Jace. And Clary’s only chance to help her mother is to track down rogue Shadowhunter Valentine, who is probably insane, certainly evil–and also her father. When the second of the Mortal Instruments os stolen, the terrifying Inquisitor suspects Jace. Could Jace really be willing to betray everything he believes in to help their father? Here’s the thing. Rereads always take me a long time, but they always make me remember why I loved the book/series in the first place. I love this series and I say this every single time I read or reread a Cassandra Clare book, but she’s my all time favorite author. I love everything she writes and will forever read everything she writes. The Mortal Instruments series/the Shadowhunter Chronicles are my favorite books and I love ALL of them. City of Ashes starts off with Jace and Clary being hella awkward around each other because they both love each other but not in the sibling kind of way they’re supposed to. It’s tragic but also funny because I know that everything works out in the end. Lol to the first time I read this and was fine with them being siblings… ha. Anyway. They make everything awkward for everyone, but specifically Simon. Simon has been in love with Clary since the beginning of time blah blah but Clary loves him like a friend and brother, so when they start dating it isn’t what either of them thought it should or could be. Simon is so sad and it breaks my heart every time because he loves Clary so much. He has always loved her so much, so it breaks his heart when he realizes that even though they’re dating, she will never love him the way he wants to be loved by her. The ending of this book really shows his great character because he tells her that he will always be there for her, but thinks she should find someone else. Aww. It’s so sad but so cute and it just hurts. Simon doesn’t like Jace automatically because he sees how he and Clary look at each other. The sexual tension is intense between Jace and Clary. Jace is kind of unhealthily obsessed with Clary for a hot sec because he finally gets to kiss her in the Seelie Court, but then everyone is weirded out because OMG THEY’RE SIBLINGS EW. But Jace loves it. Clary loves it. But for some reason they just don’t tell each other that. Ugh. The ending breaks me EVERY TIME. Clary is about to tell Jace that she loves him because she does, then he wrecks it by being nice and selfless and telling her he’s fine with them just living their lives like siblings. Clary is crushed because she finally worked up the courage. Honestly. I love Luke, and forgot how much I loved his conversation with Clary at the end of the book talking about how he’s in love with Jocelyn. Clary hints to him that she’s fine with their relationship and wants them both to be happy, and then he actually gives her some insight into what happened. Luke offered to marry Jocelyn but didn’t actually tell her that he loved her. She thought it was just out of pity, so she said no. But he’s been in love with for forever and it’s so cute and tragic but cute omg. So Clary tells Luke that he needs to tell Jocelyn that he’s in love with her and it’s just a cute moment. Jace letting Simon drink his blood on the ship so he didn’t actually die… I’m sure there’s some fanfic about that lol. I like this scene because Jace did it for Clary. And Simon, but he knew how broken Clary would be if Simon died. So he let Simon drink his blood to regenerate himself. Oh yeah, Simon is a vampire now. THE MALEC RELATIONSHIP IS STARTING AND I’M HERE FOR IT. Alec and Magnus are my favorite couple from the Mortal Instruments. And Simon and Isabelle, but that’s coming up don’t you worry. I love Alec even when he’s in the closet still because he just wants to be happy. He’s been in love with Jace since forever but doesn’t want to tell anyone. Clary and Isabelle are the only ones who know that he’s gay and I just can’t even imagine what that would be like. Especially for him because he’s in love with his parabatai and gay Shadowhunters are shunned. It just makes me sad but all will be well soon enough. Sorry. SO RAMBLY. But I can’t help it. I just fangirl over literally every aspect in this book. I get something new out of my rereads of this series every time and love that I find new things spread around. Especially little hints that were impossible to catch if you hadn’t already read the series. Cassandra Clare slays me so hard. My queen wow wow wow.